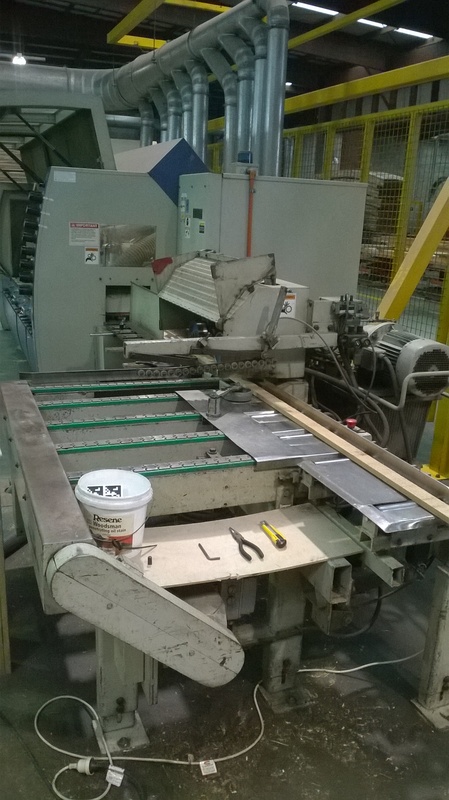 The Unimat 2000 produces a lot of custom profiles and one off jobs. 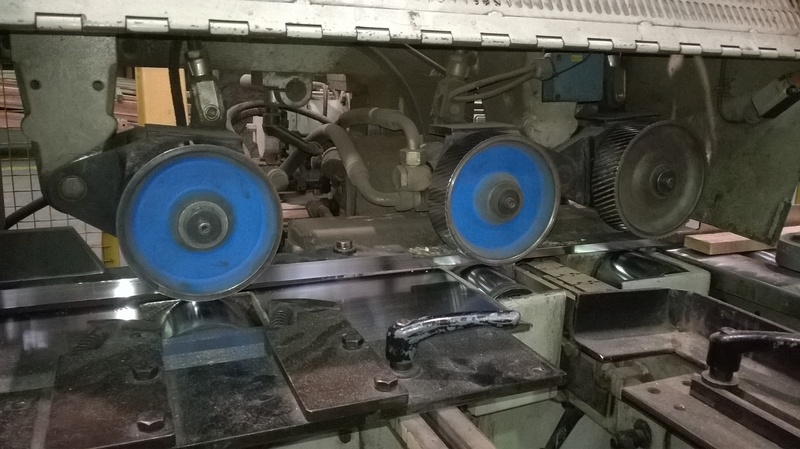 It is for this reason that a good understanding of basic in-feed operation and principals is necessary to ensure the most efficient and productive running of the machine.This course will teach the operation and set up of the in-feed system for the Unimat planer. 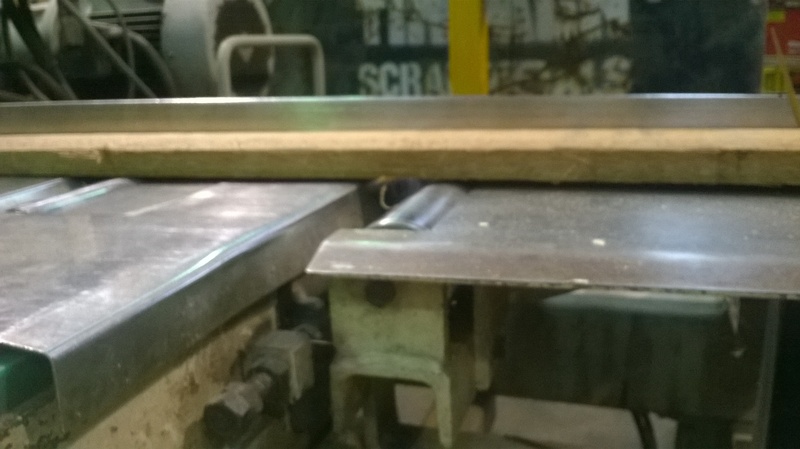 When feeding timber into the machine care must be taken to ensure that the bandsawn face is always fed facing downwards. This is because some profiles require a bandsawn face and ensures that on dressed face products the face comes out as clean as possible. If the feed stock does not have a bandsawn face then the best face must be fed face down. 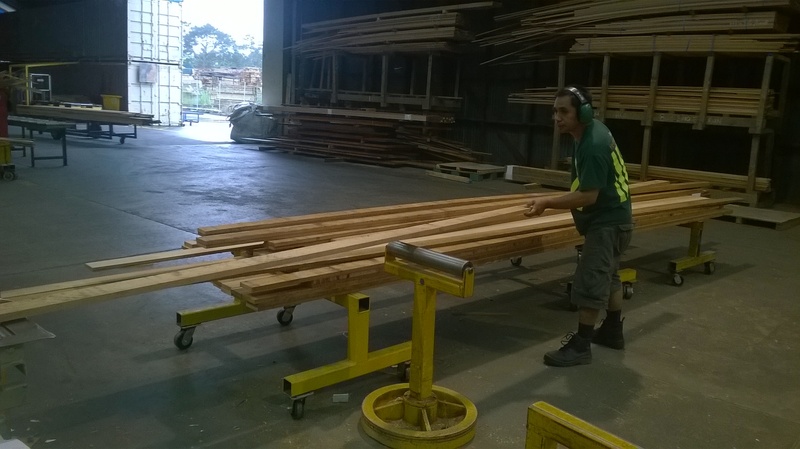 A bow is a bend in the timber vertically, a crook is a bend in the timber horizontally. All bows must be fed downwards and all crooks fed facing the fence. 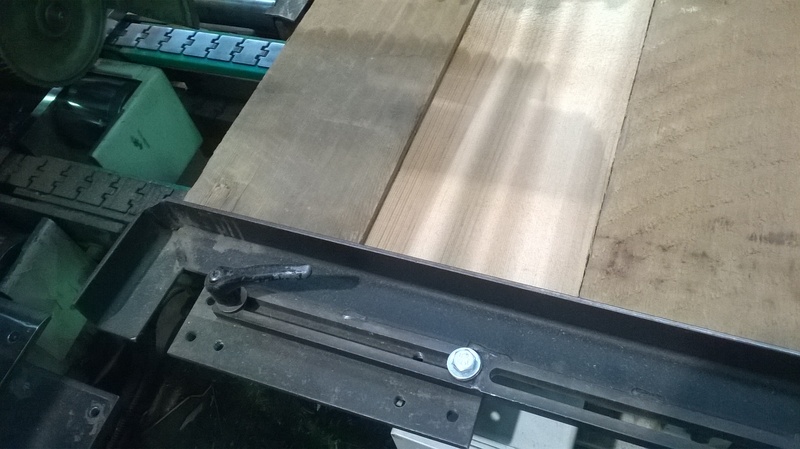 This may require boards be spun around to ensure the bend is right and the face is also correct. 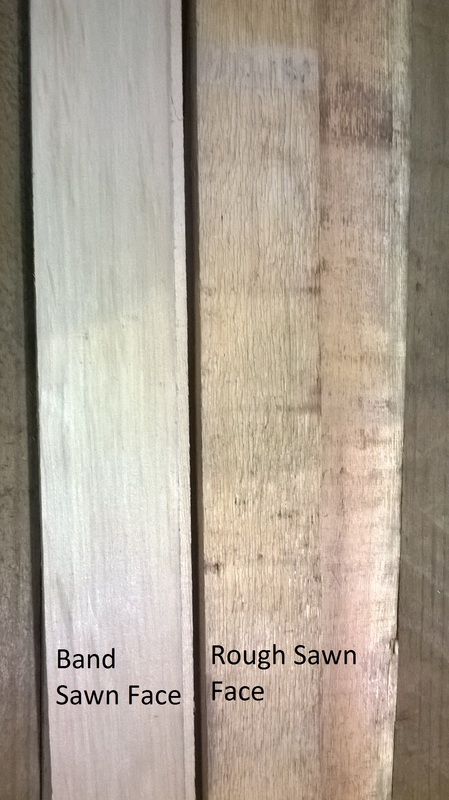 Which is the Bandsawn Face. 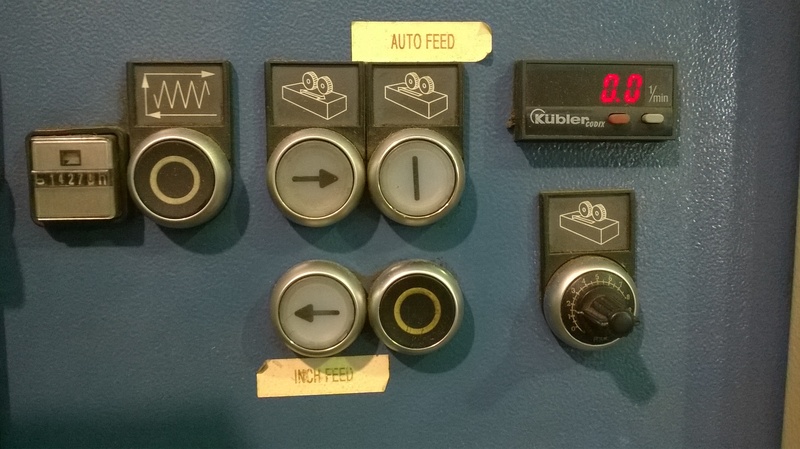 The in feed is simple to use once you understand the controls and they're uses. 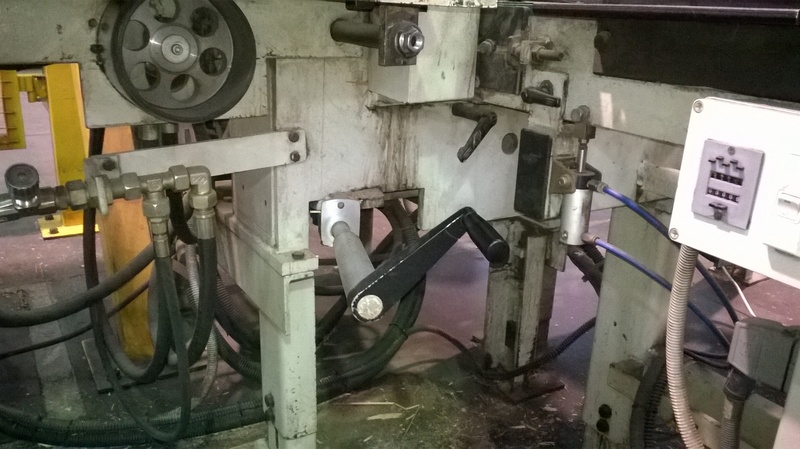 These are the in-feed rollers. They are raised and lowered using the crank handle located underneath the in-feed bed. 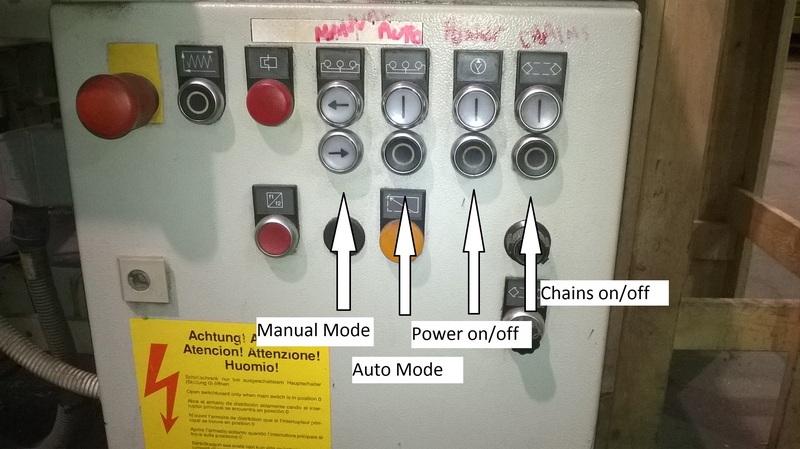 This is the Operation Panel. The first button on the left is Manual Mode. 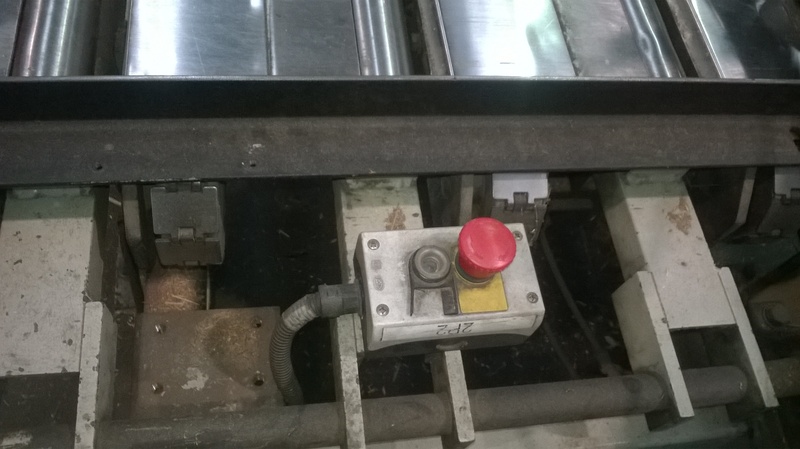 This allows the operator to control the feeding of the timber. The Second button is Auto Mode. This tells the in-feed to run continuously. The Third button is The Power switch. The Last button controls the Automatic Feeding Chains. 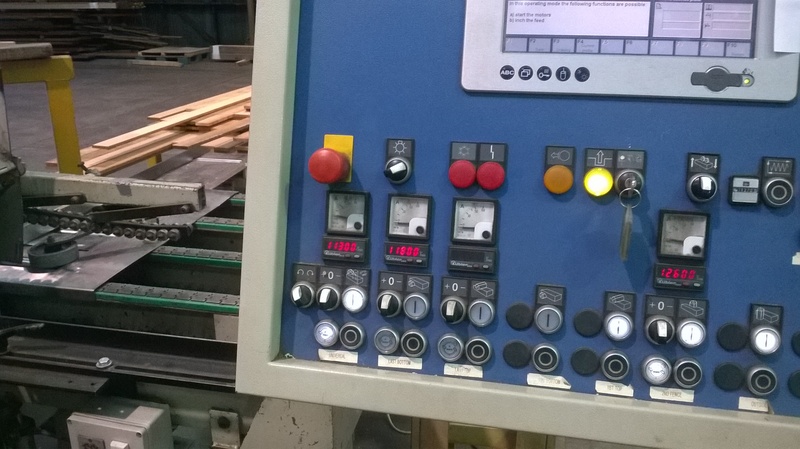 The Automatic Feeding mode will only work if the planer is on and the planer feed system is running. Otherwise the automatic mode will not switch on. Setting the In-Feed to suit feed stock. 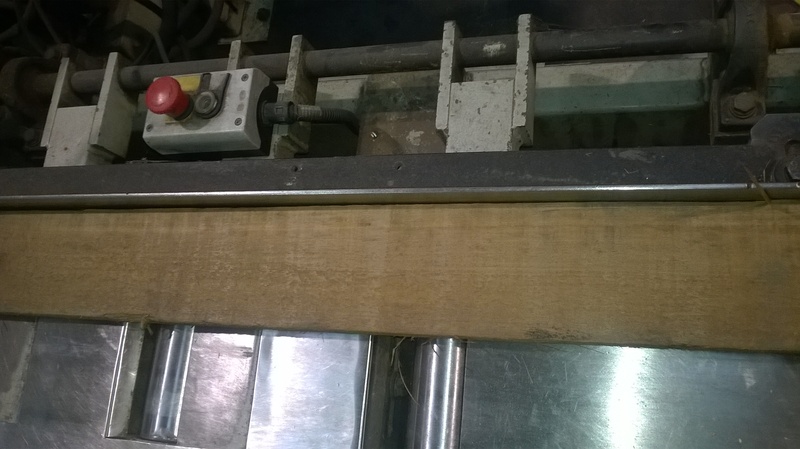 When the planer operator is changing profile it may be necessary to change the set up of the infeed system as the new feed stock may be of a different size. There are several parts to changing the infeed set up. 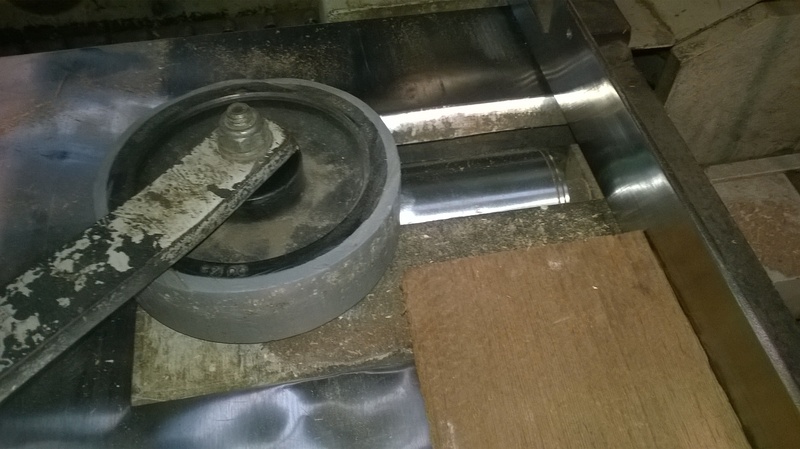 The First thing to do is change the height of the feed rollers to suit the new feed stock. 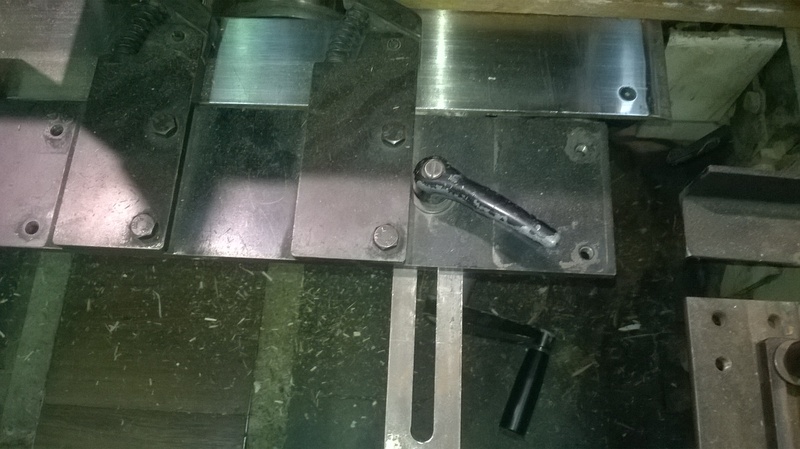 This is done using the crank handle below the in-feed bed plates. Next you must set the pressure wheel to suit. 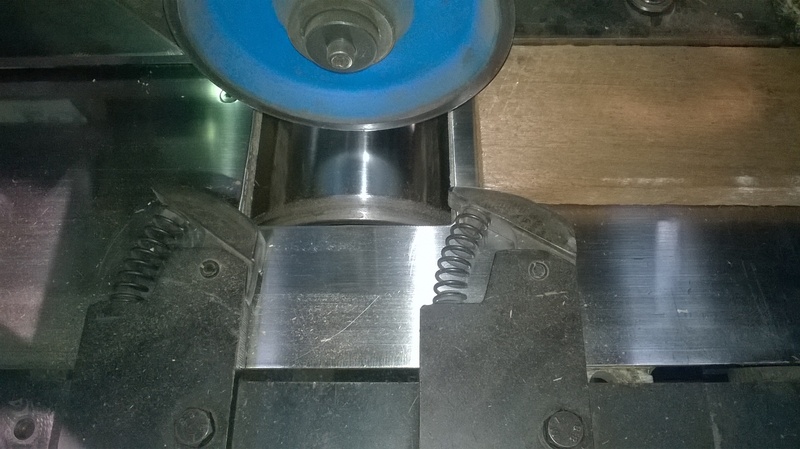 This is done by loosening the bolt on top and then setting it to 5 mm under the width of the feed stock. Next you want to set the side pressure bars to 5 mm under the feed stock size. Finally you want to set the board stop to 10 mm over the feed stock size. 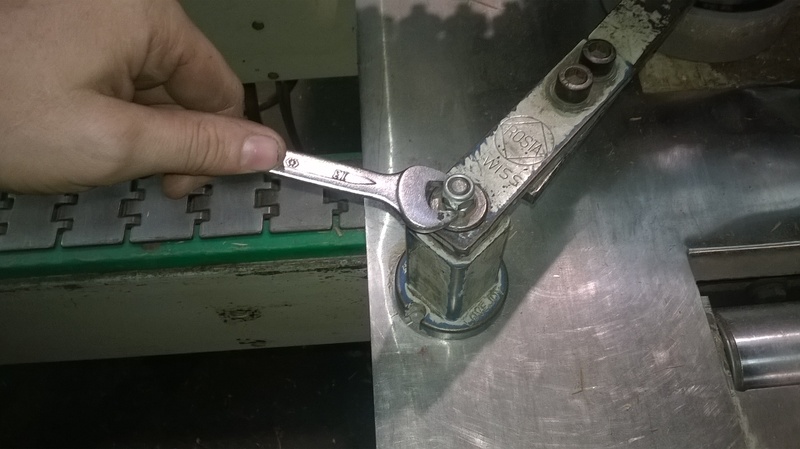 This is done by loosening the crank handle and bolt on top of the plate and sliding the stop across before re-tightening the bolt and handle. Who's responsibility is it to set up the in-feed. 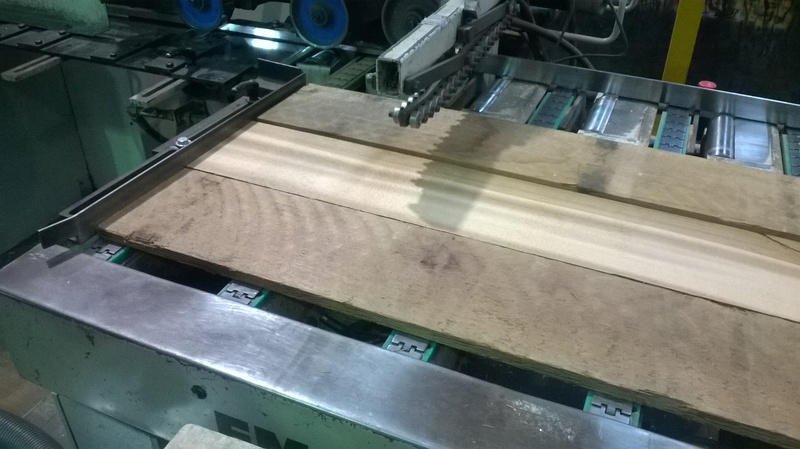 It is the planer operators responsibility to set up the in-feed. As the In-Feed operator it is your job to ensure that under size and under spec feed stock is not put through the machine. This is because raw product downgrade is easier to recover then finished product downgrade which may not be recoverable at all. 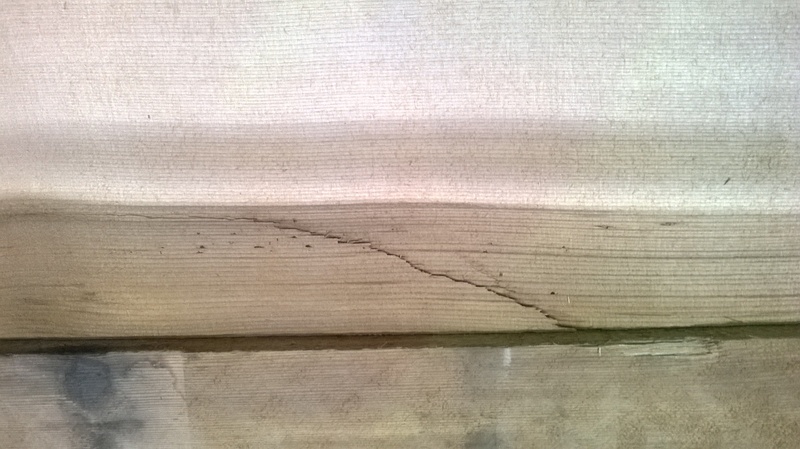 Splits and knots are the most common defects you will encounter. Some Knots may be acceptable it is best to communicate with the Machinist as to how much and how large they can be. 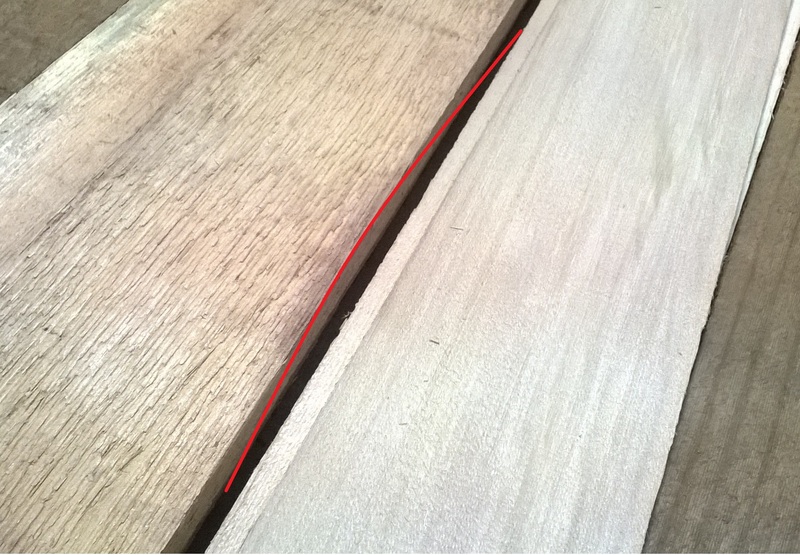 Splits in the middle of boards are best removed and end splits can be cut out with the skill saw if it does not affect the required length of the timber. The next most common defect will be under or oversize feed stock. Undersized feed stock will affect the finished product resulting in skip dressing. Oversize feed stock will jam up inside the machine. 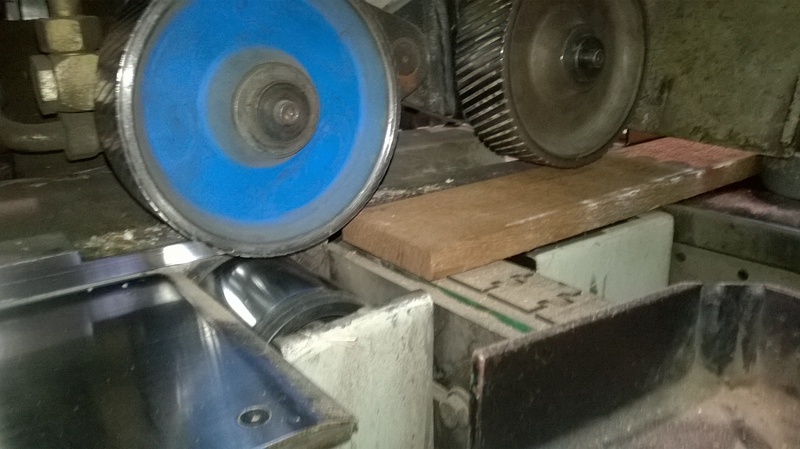 It is best to remove both undersized and Oversize feed stock and put it aside until the machinist can adjust the machine to suit the feed stock or send to downgrade to be used for a different profile. You should always ensure you are wearing correct safety gear for the job you are doing. 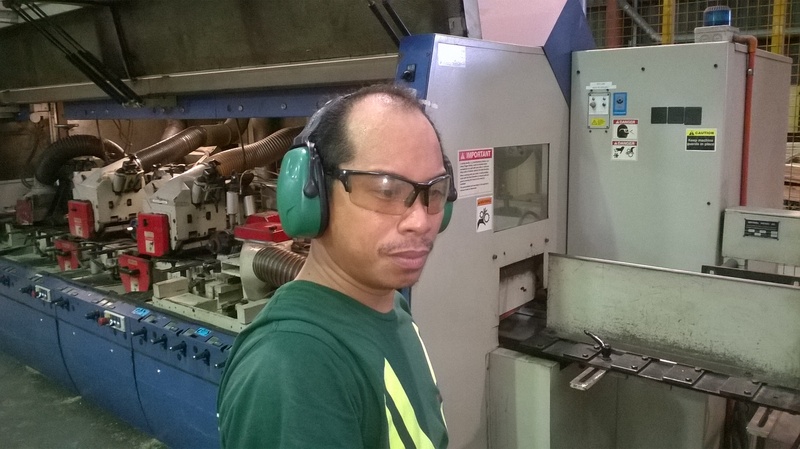 Ear muffs must always be worn when working near the machines. 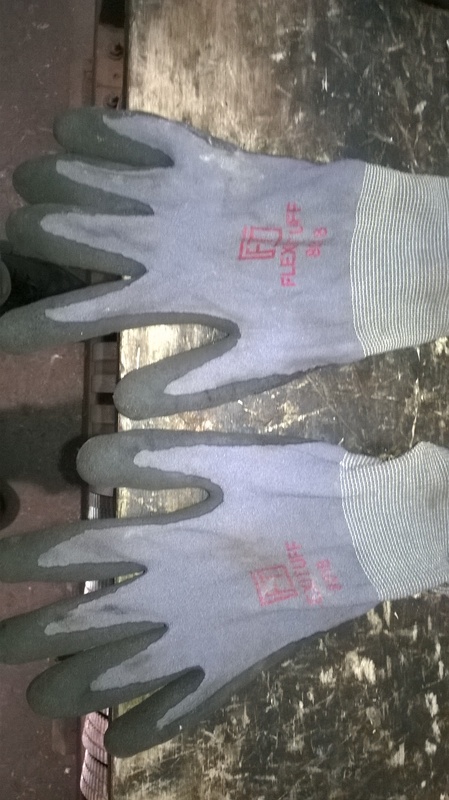 Gloves are also useful to prevent injury to your hands. If you are using the skill saw you must be wearing safety glasses. 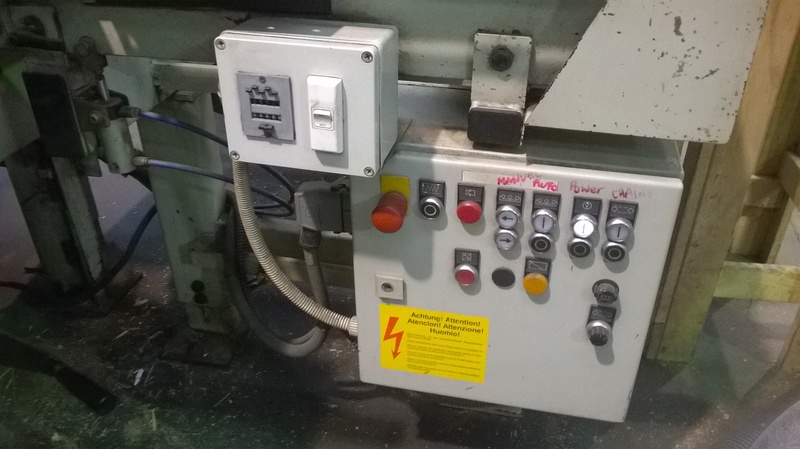 Having an understanding of dangerous components can help to prevent accidents from happening. all accidents must be recorded and all Hazards must be immediately reported. There are three emergency stops on the Unimat in feed, Beside the in feed fence, On the Unimat control panel and on the in feed control panel. It is a good idea to familiarize yourself with their locations and use. 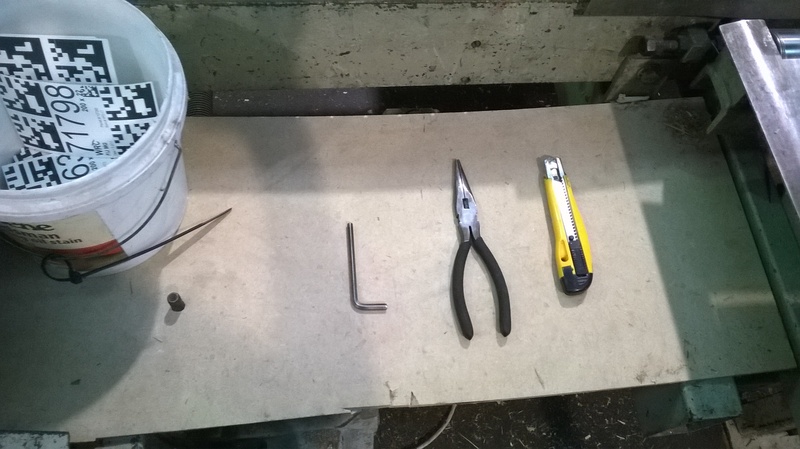 Always make sure your working area is clean and tidy!. Safety is every ones responsibilityfavorite food . The required saftey gear is, eareye muffs, gloves and safety glassesscissors . If you find a hazard you must reportrun away from it immediately.